Power-Pole® Announces A Whole New VISION Of The Future. TAMPA, FL – JL Marine Systems, Inc., maker of Power-Pole shallow water anchors, announces a new addition to its product offering that will once again change the way we fish. Not only will it change the way we fish, but it will change the way we enjoy our time on the water – no matter the vessel, no matter the size, no matter the boater interests. 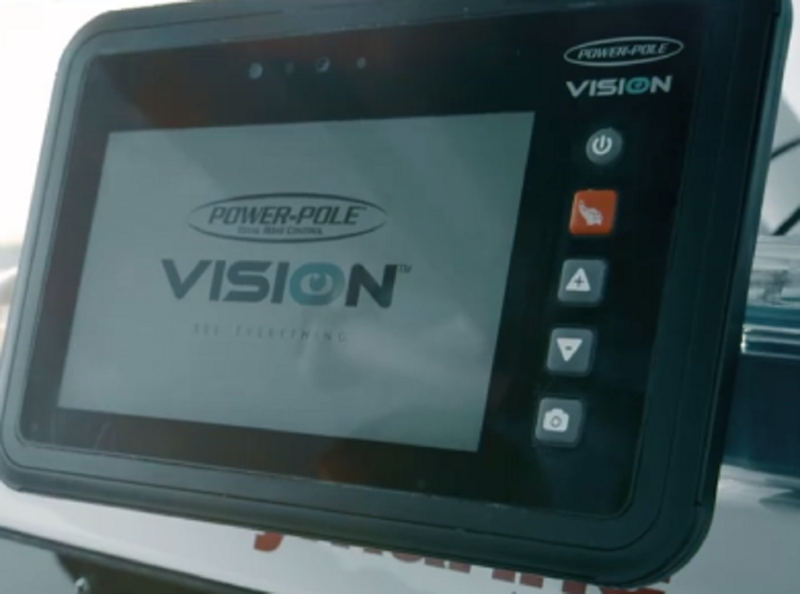 Introducing Power-Pole VISION onboard marine accessory management and multi-media tablet. 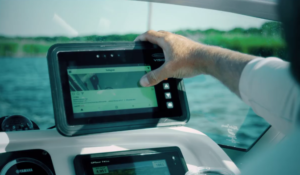 This all-in-one touch-screen tablet allows multiple boat accessories to be connected and controlled by one smart device. VISION is the marine industry’s new Digital Dash. Anything on the boat that has ON/OFF capability can now be expanded and custom controlled with dimmers, presets and timers. The six-outlet Power-Pole CM-I/O-6 Switch allows multiple inputs to the VISION unit, which integrates operation of all accessories through one central device via C-Monster 2.0 protocol. VISION runs on the Android platform. 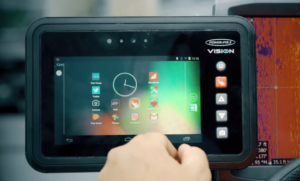 VISION is the first marine tablet that runs on the Android platform, it is NMEA capable and it can provide services beyond just the boat. Connected via Wi-Fi or personal hot spot, VISION can connect with thousands of Android apps. Use your favorite fishing or navigation apps; use the built-in camera to take hands-free photos of you holding that big catch. Then post and share photos, check email, watch your favorite sports, movies or videos. Using the C-Monster App you can also customize any of your Power-Pole CM2 family of anchors and accessories. Power-Pole VISION lets you see everything. Once VISION is connected to your boat’s accessories it lets you see and control everything. Add NMEA connectivity and you can see engine data like speed, rpm and fuel levels. The super-bright screen is readable in full sun even with polarized sunglasses making it easy to read anywhere. Our patented enhanced map viewing technology lets you easily see and track your position using satellite images. VISION features daylight and nighttime settings, it even lets you select different background themes to compliment your vessel’s decor. And the exclusive swipe-down Water Shade protects and locks the screen against water spray that might activate or change your screen settings while running across the water. 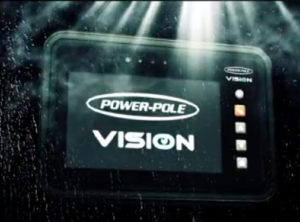 Power-Pole VISION delivers total boat control. We have a VISION for the future. Power-Pole has stepped up to the helm of your boat with a digital dash that delivers a view of your vessel from the inside out. VISION also communicates with the new Power-Pole CHARGE so you can get an instant real-time view of your battery power levels and power flow. Find out more about Power-Pole CHARGE Marine Power Station. Power-Pole products continue to lead the way with innovative technology that puts a spirit of confidence into the fishing experience. All backed by the industry’s best customer service. 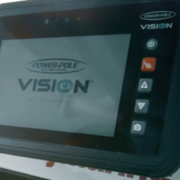 For more information on Power-Pole VISION, contact Robert Shamblin at 813-689-9932. About JL Marine Systems, Inc.
JL Marine Systems, Inc. is the Tampa, Florida-based manufacturer of Power-Pole shallow water anchors. With a complete line of hydraulic plus the all-electric Micro, Power-Pole anchors are perfect for all small skiffs, bass boats, flats boats, bay boats, kayaks and more. Power-Pole anchors are distributed via more than 1500 dealerships throughout the US. Visit www.power-pole.com to find a local dealer.